Context - Food and drinking water typically contain at least small amounts of fluorides. They occur in the environment both naturally and as a result of human activities. 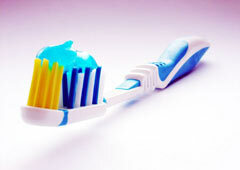 Fluorides are commonly added to dental products – and sometimes to tap water – to prevent cavities. Under what conditions can fluoride exposure be beneficial or detrimental to human health? Fluoride can help prevent cavities, but at high intakes it can harm tooth development (dental fluorosis) and bones (skeletal fluorosis); there is a narrow range between intakes which are beneficial and those which are detrimental. Populations consuming artificially fluoridated drinking water or other fluoridated products, such as fluoridated toothpaste, develop fewer cavities. All organisms both on land and in water are exposed to fluoride released from natural sources and/or by human activities. Excess exposure poses a risk to them.